Jet Engine mounts – that incredible wing! There is much said about the Germans and English (esp. Frank Whittle) with regard to the jet engine but very little in line with the airframe and designs used in conjunction with turbine propulsion. Passenger and cargo aircraft with amazing power and lift hold most of us in awe and just short of being an aviation engineer to understand the dynamics involved the layman really has very little understanding of aircraft in general. I find the aircraft wing one of the most fascinating pieces of engineering yet we all know so little about it. Picture the last time you took a flight and recall how the wings started to bounce while taxing along the runway. As a layman an oft asked question is how the deuce are those massive engines mounted onto the wing or tail section of an aircraft? If you have never asked yourself this simple question then possibly you have never flown before because well, a wing is just a piece of aviation strength aluminium isn’t it? When you take an engine, actually 4 engines like in a Boeing 747 and mount them to two wings one would think that they would break off with all that weight. Each engine weighs upwards of 4 000Kg so it is totally amazing that it doesn’t. Or is it? Look at the bird front on before a long haul and you’ll see that the wings do look they are hanging downwards. The wingspan on a 747 is approximately 60m in length and carries nearly 200 000 liters of fuel plus four ginormous jet engines so certainly it’s going to pull downwards. If you find this fascinating just look at the Antonov An-225 Mriya, the Russian juggernaut, said to be the longest, heaviest and with the greatest wingspan of around 80m (84m). The aircraft wing is actually an extremely sophisticated part of the aircraft with many rib-like sections and internal braces made up inside which serves to strengthen the overall design and with a massive spar running through nearly the entire length – completes the horizontal strength to allow for the additional weights of the engines, fuel and hydraulics. Aircraft parts are designed to be light and strong – aluminium is just this but it still needs careful design to allow for flexibility and show minimum signs of fatigue after thousands of hours in the air. When one sees the wings flexing in heavy weather remember that they are designed to do this – and lots lots more. Manufacturers bend these wings sometimes up to 45 degrees from the horizontal plane – I believe that during tests it’s not uncommon to see the wing being bent until it breaks. (Experimental Aircraft’s Association: design engineer in Seattle 1972) – A 747 wing is reputed to be able to bend approximately 26 ft or about 8m before it snaps. A wing weighs about 28 000 lbs or 13 metric tons. These stress tests get logged – a wing that cannot handle a load of 150% of maximum load (in the case of the Dreamliner which uses composite materials) will fail the test. This sees insane tests being done to determine the maximum load carrying weight of the wing. Think of 4 engines each delivering more thrust than the entire complement of engines on the 707 pulling this aircraft forward – the modern 747 jet engine has more than 60 000 lbs of thrust per engine (compared to the F15 Eagle’s 50 000 lbs/ft with both engines and afterburners lit) which puts the magnificence of this mechanical marvel into perspective. Now taking four engines, maximum thrust and a full payload one can only gasp in awe at the expertise of the design team to put this beautiful aircraft into the air. 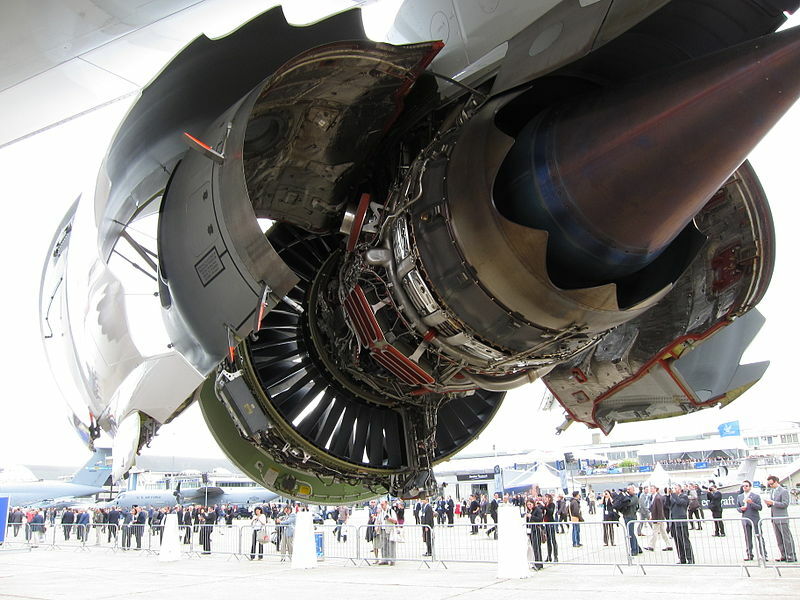 The jet engine can be mammoth, such as on the 747 but yet for their size and power they are surprisingly light. Try to put a diesel engine on a wing designed to put out the same amount of thrust. Think of an 8 cylinder ship’s engine. No, the jet engine is a marvel – the power to weight ratio is what makes them the best form of prime-mover in an aircraft plus their uncanny lack of thirst above 30 000ft. The engines are mounted to pods on the wing, usually for’ard of the leading edge of the wing to prevent in the unlikely event of catostrophic failure that disintegrating parts fly into the wing and rupture the fuel tanks, hydraulic lines or worse still shearing a wing in half. With many millions of passengers flying annually, how many actually think about the stresses placed on the wing, especially in turbulence. Harping on the 747 and the incredible safety record one can only admire the engineering that has gone into their design – mine would always be around the wing, something we look at, admire but know very little about. Getting back to the first point, much of what is written is about the turbine, compressors and the inner workings of the engine – very little about the airframe and for me, wing design. It is indeed a very complex piece of engineering and if one had to look over the last fifty years of air travel the wing has remained more or less the same except for adding winglets to reduce turbulence and induced drag. While we all take jet travel for granted and yes it is one of the safest means of transport there have been notorious examples of sloppy workmanship and of ground crews taking dangerous shortcuts – one such example was that of the removal and refit DC10 engines with the use of improper gear and not following manufacturer instructions and warnings – see wiki. Of course the reality is, once you are in the sky it becomes pretty much evident that any shortcut is a dangerous shortcut. Aircrash Confidential produced by WMR Productions and IMG Entertainment is a very popular television series and throws the spotlight regularly on maintenance crews not following procedure – an extremely dangerous practice. Jet engines are not fastened to a wing with myriads of bolts, in fact like the fascinating beetle – it may only have four bolts, sometimes even less. These bolts are also designed to shear off in an emergency – this lessens the damage that can be caused through vibrational issues or in landing emergencies. These bolts are also strategically placed to take the lateral and longitudinal loads but without creating additional stresses on the engine during expansion and contraction. There’s lots of talk on the web regarding explosive bolts which flight crew can detonate in times of an emergency to jettison an engine – this is not a conventional way and the aero pages don’t point to this either, many of them plainly disregard this as a fallacy. Some aircrafts do use these bolts for landing gear and the Shuttle mounts on the 747. While most commercial aircraft these days use the wings as the support for the engines older design favoured the tail or aft section to mount the engines. This has a few drawbacks, maintenance, weight distribution, (I didn’t like the noise aft), many engineers don’t like the heavier T-Tail compared to wing mounts and of course wing flutter. Longer fuel runs and the extra weight needed to strengthen the tail section to mount these engines also add to these disadvantages. Smaller aircraft favour this type of mount because of under wing space saving for landing. Aft mounts also allow for uneven amount of engines to be used. According to reports the engine mounting type also depends a lot on the environment and landing conditions – many pilots favouring the tail mount for some of the dodgier areas in Africa. I doubt I would pilot a plane into territory like this but then again a pilot in many instances, going back decades, was also an adventurer. While on the subject of environment, many pilots believed the rear mount was dangerous when it came to ice build up on the wings which once dislodged was directly in line with the engine inlets. Most manufacturers have gone the way of Boeing and now mount engines beneath the wing which reduces the bending movement of the wings. Having flown in many aircraft using rear mounted propulsion I was always a bit angst, possibly due to reputation and age of the aircraft. Although not having a fear of flying I must admit that I do feel safer in a Boeing than most other aircraft. The unnecessary negative hype attached to rear mounted engines may be the cause of this, I don’t know. The 737 and 747 remains still to me the ultimate passenger and cargo carrying aircraft. For many of us, the jet engine sitting at the bottom of a wing just adds to the cosmetics – for others it is an engineering marvel. ← Cheap Energy – Is this a Myth?